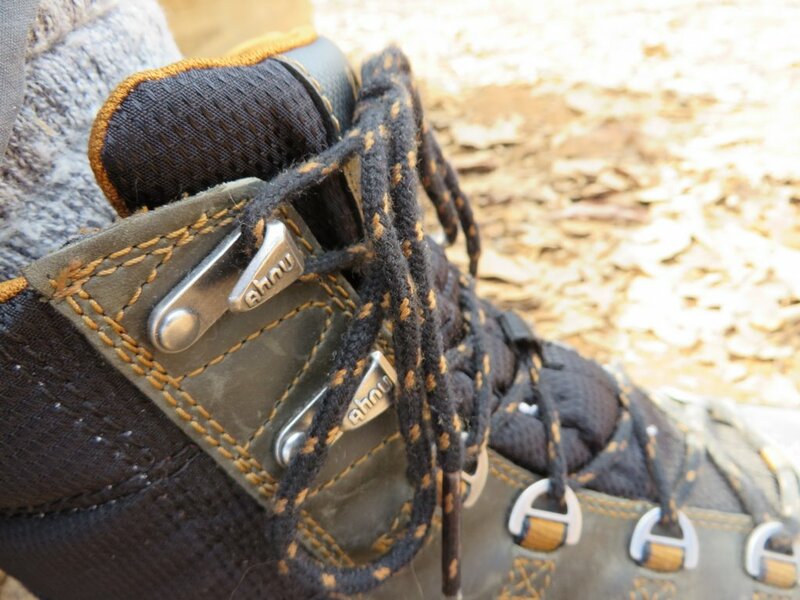 The Coburn boots from Ahnu are lightweight hiking and backpacking boots, complete with waterproof eVent fabrics and a tough full-grain leather body. I’ve been putting these boots through every test I can find, and this is what I found. The boots are built with a light weight, almost minimalist approach. The boots itself is mostly full-grain leather, with a full sewn in bootie built from waterproof eVent material for protection and breathability. Light padding lines the ankle, and EVA plugs and external support struts help to stabilize the boot, while still retaining flexibility. A grippy but flexible sole provides traction and support, without creating bulk or weight. The boots come in two color variations, a full range of sizes, weigh only 2 lbs 2 oz per pair and retail for $165. 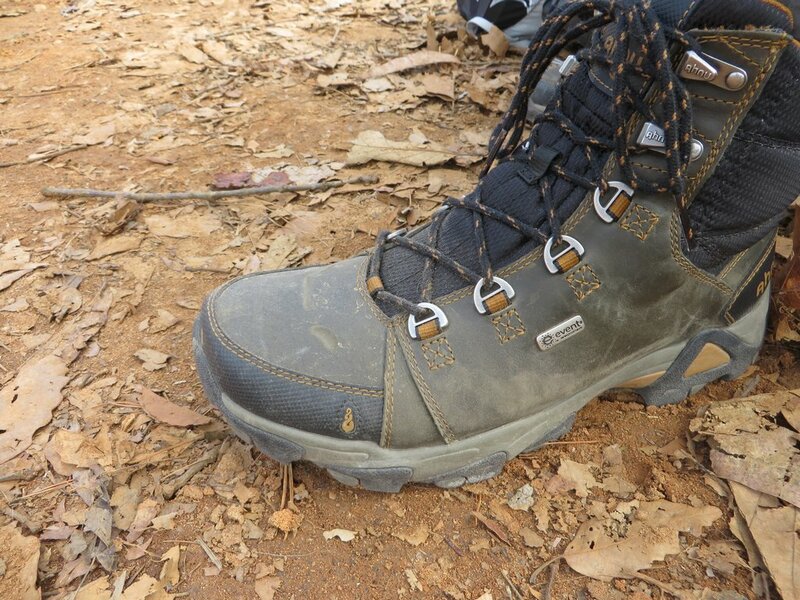 The Ahnus are some of the lightest boots that I’ve tested, which I consider to provide real trail worthy protection. While putting down fast miles, I occasionally found myself looking down to see if I forgot to exchange my favorite pair of shoes for boots, surprised to see boots; Still, they managed to take my never ending barrage of rock kicks, scrambles, and shuffling along miles of trail with no discomfort. The boots are quite stable, especially for such a light weight boot. 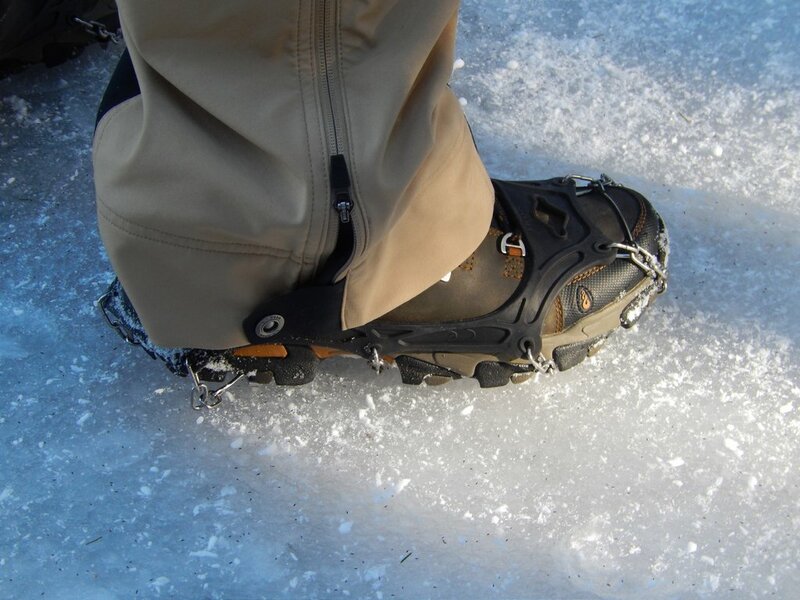 I never once rolled my ankles or felt like I was wrestling for grip on tricky crags thanks to the supportive collar, heel stabilizer and grippy outer sole. Despite the light weight, the sole and foot bed absorbs shock pretty well while still allowing flexibility and tactility. The eVent fabric bootie (liner) does a solid job of keeping out the elements. Slushing through water crossings, rain, and frozen tundra has no effect as long as you keep it below the 4th eyelet, where the eVent bootie ends. Moisture management is also quite good. On warmer, more energetic hikes, my feet stayed mostly dry (a feat for my feet in waterproof boots) despite perspiring for hours on end. Out of the box, the leathers are soft and wrap gently around the foot. Minimal break in time was needed before I was able to take them on the trail. 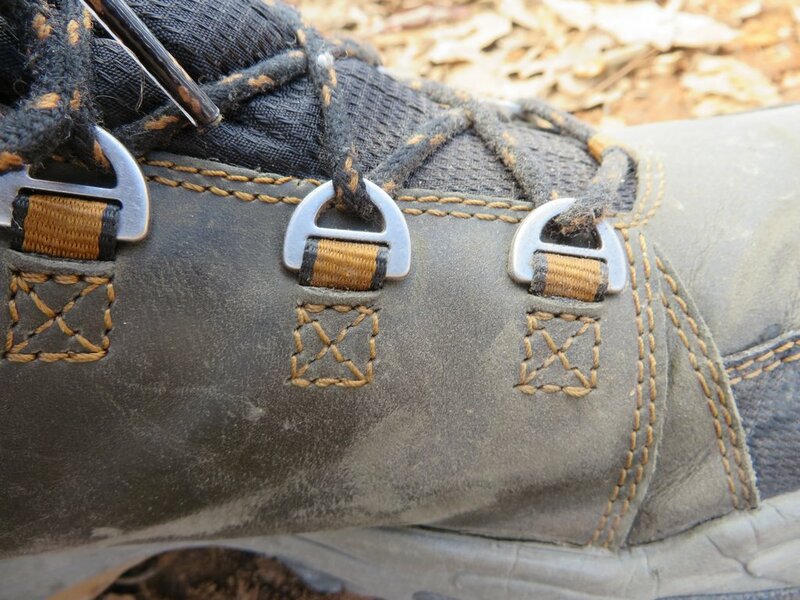 Once broken in, the sole is very flexible, providing a good tactile sensation across tricky terrain but still provides enough support for light backpacking and all day hiking. Looking good will come easy with these alluring lads strapped to your feet. Even when they get muddy, the polished leather shakes it off and requires very little cleaning. Self-cleaning lugs kick off mud globs and debris. The boots have minimal padding under the uppermost rectangular eyelets. The tongue alone provides protection between your foot and the metal. This can create a pressure point against the ankle, especially during the break in period. Initially, I found this to be quite painful, but mostly became a non-issue after they softened. For longer trips I would suggest thicker socks to provide a little more cushion. Being a light weight boot, you get a light weight sole. It feels great, but not quite stiff enough to provide support for longer hauls with heavy packs. I’d keep your pack under 30 lbs if you’re a tender foot like myself or putting down high mileage treks. The Coburns are a solid, lightweight, supremely comfortable boot. They provide serious water proof weather protection, while not overheating and causing wet outs from the inside. Give them adequate break in time, and you’ll find they feel more like a comfortable, yet surprisingly supportive shoe than a boot. If you’re planning on carrying lighter weight packs, or sticking with day hiking, these are a great choice. 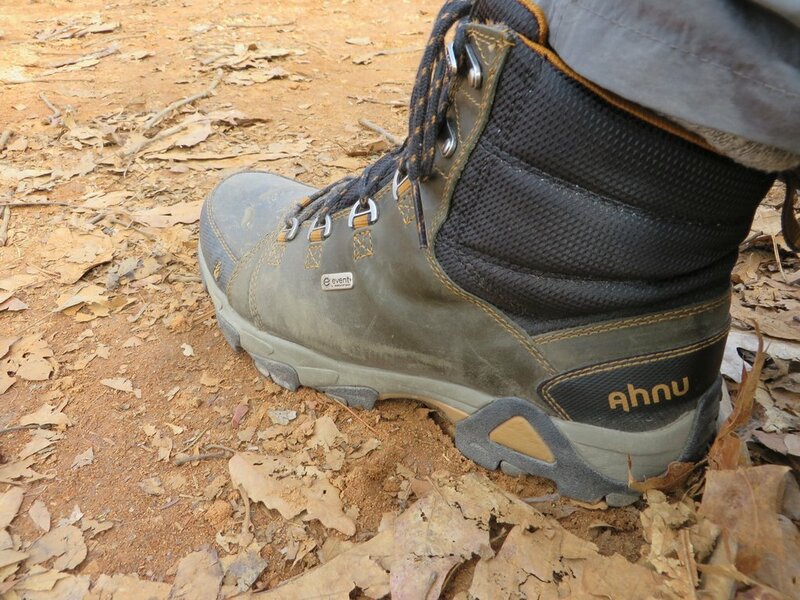 Big thanks to Ahnu for providing these excellent boots for review. A full disclosure can be found on our about me/contact page. I’m having serious issues of grip on wet stone. One of the worst performance I’ve ever had. Is this gonna improve with time or should I rather return them? I really really really need something with serious good grip on the wet. Any suggestion? I really would like something with this comfort… But grippy! If you’re spending lots of time on wet rock, you might consider another boot. These have pretty decent grip, but they’re not quite robust enough for that type of use. Vibram soles offer a good balance of grip and ruggedness, so maybe start looking there. I’m currently looking at the Merrell Capra, which is a waterproof boot with a Vibram sole. Depending on your needs and foot profile, this could work for you as well. Salomon makes a nice lightweight alternative, and Oboz might be a brand that falls in the middle. Thanks. I had the Salomon xa pro 3d and they were just decent. But quite uncomfortable. The Adidas terrex agravic with Continental sole were pretty amazing in wet stone. But only low, and the sole wore out in less than one year enough to have less grip on mud. Anyway i consider them the best compromise till now. I was considering the lowa or kayland with Vibram Tsavo because not all Vibram are good in wet. I’ve read the Tsavo is. I know that innov8 tends to have good grip and i think the roclite 325 gtx may do the job. Otherwise no idea. What about these oboz? Yeah, that’s something you’ll have to contend with. The softer material soles (like Megagrip) will wear down much faster than the harder, more rugged soles they make. The Tsavo should work well to find that mid-ground, but I don’t think I’ve tried it personally. The Vialta could also work for you, if you don’t mind more dense lugs (a little worse for mud). Have you worn any Oboz before? They tend to fit a bit narrow, like the Salomon you mentioned didn’t work for you. Although, they are a little wider.